Kanu Surf presents our newest swim trunks yet. Kanu, a surf and swim lifestyle brand, is well known for great prints and colors along with high quality functional apparel for the whole family. All of our trunks are made with our comfort technology quick dry fabric with a UPF 50+ rating. All trunks have 2 side pockets. Some have 1 or 2 cargo pockets as well for extra storage. Most trunks feature triple needle stitching for extra durability. These trunks are built to last. Our reflection trunk is a hip stripe print with 2 side pockets and a cargo pocket. Mesh lining. Outside drawstring. Available in boys 2-20. 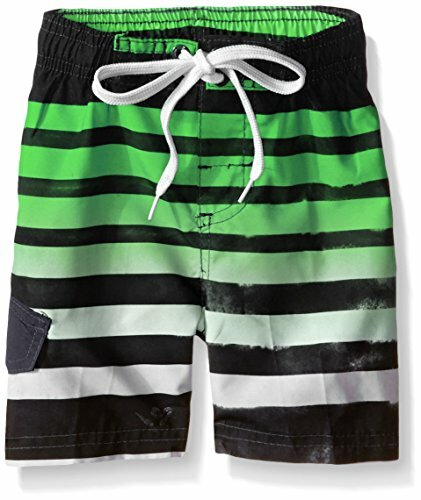 Matching styles in adult sizes so dads and kids can hit the beach scene as a team.